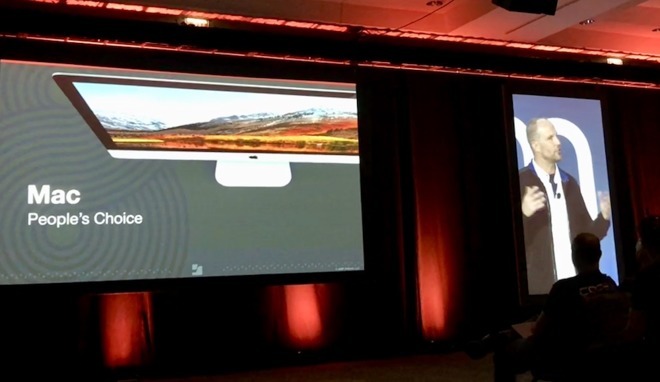 Addressing 1,500 attendees at its Jamf Nation User Conference, Jamf CEO Dean Hager announced an October 31 general availability of Jamf Pro 10, the latest version of the company's enterprise device management suite for Macs, iOS devices and Apple TV. As a company, Jamf is focused specifically on enterprise and organizational management of devices in the Apple ecosystem, rather than offering a generic management tool aimed at a variety of different platforms. "Somebody has to recognize the Apple experience can not be achieved by treating all devices from all manufacturers the exact same," Hager stated. "Apple users want the Apple experience and Jamf seeks to provide that." 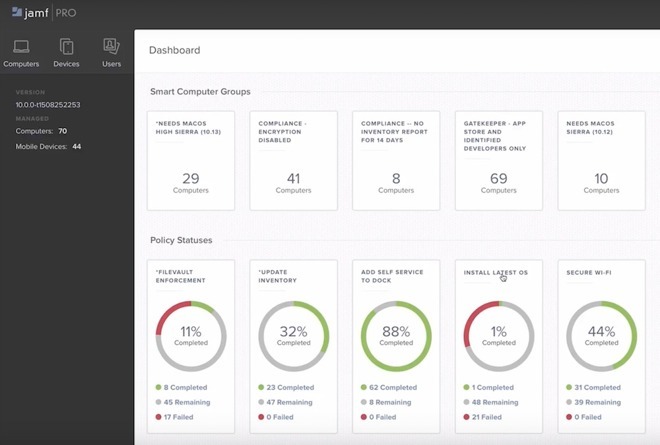 The company's latest release, Jamf Pro 10, handles the deployment, management and configuration of fleets of Apple devices for businesses, hospitals, education and other organizations. The new version overhauls the user interface of its management console, retaining familiarity for existing users while making improvements to enhance the ability of new users to get started and be productive. The new dashboard improves reporting features and provides new breadcrumbs and collapsible navigation elements and contextual error warnings. The company also worked to optimize Jamf Pro 10 for mobile use, enabling IT administrators to handle tasks and monitor inventory and reporting from iPad. The release also enables organizations to customize the management tool client with their own branding, and improves the system's ability to selectively roll out updates and configuration profiles to specific systems. The company also outlined partnership integrations with third parties, including eSpark, a company that delivers dynamic iPad app management for classrooms; Tableau, Splunk, RobotCloud and Microsoft's EMS (Enterprise Mobility + Security) package for identity-based security of cloud services. Speaking in the opening keynote session at what he called "the largest gathering of Apple IT professionals in the world," Hager described an "incredible momentum for the Mac" in the enterprise, noting an ongoing growth trend he referred to as "a movement," driven by the Mac being "the people's choice." That shift has grown rapidly over the last decade, driven largely by iPhone demand that sparked BYOD ("bring your own device") policies across companies that had previously made centralized IT product buying decisions. While Jamf first got started in managing Macs in the enterprise back in 2002, the company acknowledged that Apple initially seemed to only see limited potential for selling its products to businesses. "Apple helped the enterprise focus on the user"
Hager cited comments by Steve Jobs, made in 2010, that expressed that Apple was focused on building devices for individuals rather than seeing enterprise sales as a major opportunity. This was largely due to the fact that IT groups at large companies had long bought devices for their users, often based on their existing relationships with vendors, in particular Microsoft and its PC partners. Apple's enterprise efforts were actively resisted by companies for years following Jobs' return to Apple in 1997. However, the huge productivity leap in mobile afforded by iPhone in 2007 radically changed this. iPhone quickly penetrated into businesses as executives and other employees began insisting that IT support them, fundamentally changing how enterprise buying decisions were made. This has resulted in employee performance gains, higher satisfaction and cost savings, particularly in regard to user support and device reliability. The broad shift in enterprise purchase policy has also changed Apple. Earlier this year, Tim Cook stated that "enterprise is the mother of all markets" for Apple. While this shift has commonly been attributed to individuals pushing their companies toward BYOD policies, Hager noted that in reality, "Apple helped the enterprise focus on the user." The shift in companies and organizations such as hospitals and schools seeking to accommodate the needs of their users rather than simply rolling out centralized solutions from the top down has been a windfall for Jamf. The company's products are also used by an even larger number that use a free tier, with over 21,000 organizations making use of the free-to-use, entry version of Jamf Now. The company also counts 53,000 members of its Jamf Nation online user group, a community the company addressed with new social media features for highlighting useful support documents. Answering his own question of whether the company would continue to be focused on Apple, Hager remarked, "Hell yes!" Beyond the growth of Macs in business, Hager also specifically noted the rise of iPad Pro, which he said has been the first tool that has allowed him to become entirely paperless at work. He called iPad "transformative," in that it brings technology to users in environments such as hospitals, schools and in retail where classic computing form factors—even light weight MacBooks—don't make as much sense. Hager cited iPhone as the central hub of activity in business, calling AirPods—which he called out as his favorite new product of the last year—not merely wireless headphones but "an enterprise business machine hanging from your ears." He described Apple Watch as an "informer" business machine, joking that it currently tells you to stand or breathe and who knows what it will dictate next.' But he also called out the productivity gains seen in wearing Apple Watch by business users with active schedules and in need of regular updates of business information, calling Apple Watch "the ultimate notifications machine in the world." Whether notifications of inventory running low or doctors having hands-free access to a system that keeps them updated on patient status and tells them where they are needed and what to do next, Hager noted Apple Watch as an emerging business tool with enthusiastic users. He outlined that use cases will improve as the device becomes easier to manage and deploy by companies. Hager also called attention to Apple TV as more than just being an entertainment device for the home living room, describing it as a tool for educators, conference presenters, hospitals and hotels—noting in particular that it is effortless to configure remotely using centralized mobile device management after simply plugging it it. Jamf's conference in Minneapolis, Minnesota is hosting a series of speakers over the next three days from Apple, partners including Microsoft and clients who use the product ranging from Walmart to SAP to Capital One bank to school districts and charitable groups such as the Bungie Foundation, which works to install and manage iPads benefitting children in hospitals.